Lithium-sulfur batteries have been a hot topic in battery research because of their ability to produce up to 10 times more energy than conventional batteries, which means they hold great promise for applications in energy-demanding electric vehicles. However, there have been fundamental road blocks to commercializing these sulfur batteries. One of the main problems is the tendency for lithium and sulfur reaction products, called lithium polysulfides, to dissolve in the battery's electrolyte and travel to the opposite electrode permanently. This causes the battery's capacity to decrease over its lifetime. Researchers in the Bourns College of Engineering at the University of California, Riverside have investigated a strategy to prevent this "polysulfide shuttling" phenomenon by creating nano-sized sulfur particles, and coating them in silica (SiO2), otherwise known as glass. 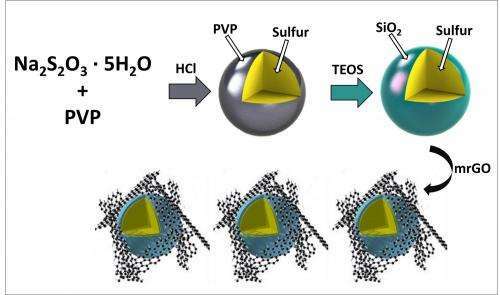 The work is outlined in a paper, "SiO2 - Coated Sulfur Particles as a Cathode Material for Lithium-Sulfur Batteries," just published online in the journal Nanoscale. In addition, the researchers have been invited to submit their work for publication in the Graphene-based Energy Devices special themed issue in RSC Nanoscale. Ph.D. students in Cengiz Ozkan's and Mihri Ozkan's research groups have been working on designing a cathode material in which silica cages "trap" polysulfides having a very thin shell of silica, and the particles' polysulfide products now face a trapping barrier - a glass cage. The team used an organic precursor to construct the trapping barrier. "Our biggest challenge was to optimize the process to deposit SiO2 - not too thick, not too thin, about the thickness of a virus", Mihri Ozkan said. Graduate students Brennan Campbell, Jeffrey Bell, Hamed Hosseini Bay, Zachary Favors, and Robert Ionescu found that silica-caged sulfur particles provided a substantially higher battery performance, but felt further improvement was necessary because of the challenge with the breakage of the SiO2 shell. "We have decided to incorporate mildly reduced graphene oxide (mrGO), a close relative of graphene, as a conductive additive in cathode material design, to provide mechanical stability to the glass caged structures", Cengiz Ozkan said. The new generation cathode provided an even more dramatic improvement than the first design, since the team engineered both a polysulfide-trapping barrier and a flexible graphene oxide blanket that harnesses the sulfur and silica together during cycling. "The design of the core-shell structure essentially builds in the functionality of polysulfide surface-adsorption from the silica shell, even if the shell breaks", Brennan Campbell said. "Incorporation of mrGO serves the system well in holding the polysulfide traps in place. Sulfur is similar to oxygen in its reactivity and energy yet still comes with physical challenges, and our new cathode design allows sulfur to expand and contract, and be harnessed."